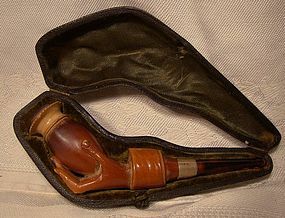 A true antique Victorian hand carved waxed meerschaum clay pipe in the form of a cuffed hand holding a bowl. This 4-5/8" smoking accessory features the original pressed amber mouthpiece, the silver plated brass ferrule and the ornately carved cuffed hand and bowl. 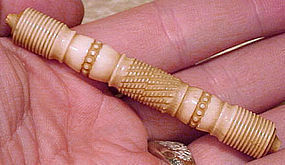 This example has the warm brown colour found on waxed examples. As an option, quality tobacconists and pipesellers offered a custom waxed finish, a labour intensive preservative and enhancement feature. This one has the typical lightly waxed rim of the bowl as contrast. The detail is superb as you can see. It comes with the original green silk and plush lined hinged leather wrapped case. It is in very good condition with no cracks, dents, bends, corrosion, losses, damage or repairs other than wear to the leather finish on the case and a small loss to the rim of the bowl. All items are thoroughly and conservatively graded and all condition issues are noted; all items are vintage or antique and may have slight signs of gentle use. Expedited tracked and insured parcel shipping to the U.S. starts at $22 (other spots may vary, air is higher). Items paid with a credit card will be shipped to confirmed addresses only. We do ship internationally. All of our prices are in $US. PLEASE NOTE: We DO NOT accept PayPal. A vintage 19th century Mauchline ware wooden souvenir string or thread holder depicting a view of Carlingford, Ireland with a photo transfer. 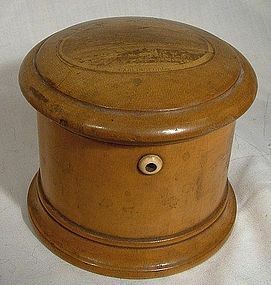 This 2-1/2" tall box is 3-1/4" across the base and it has a bone (probably) eye through which the string can be drawn. This souvenir is in excellent condition with no chips, cracks, losses, damage or repairs. All items are thoroughly and conservatively graded and all condition issues are noted; all items are vintage or antique and may have slight signs of gentle use. Tracked parcel shipping to the U.S. starts at $16.80 (other spots may vary, air is higher) - tracking and insurance are included in shipping quotes. Items paid with a credit card will be shipped to confirmed addresses only. We do ship internationally. All of our prices are in $US. PLEASE NOTE: we DO NOT accept PayPal, only VISA and MASTERCARD. 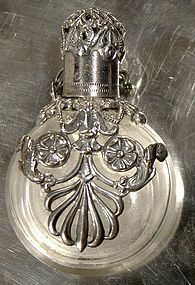 A 19th century engraved and gilded sterling silver chatelaine perfume flask. 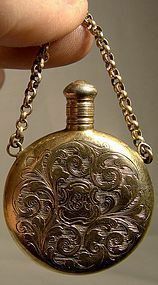 This 1-1/4" diameter pendant flask measures 2-5/8" from the top of the hanging chain to the bottom, the engraving is finely done and different on both sides, and it has the original threaded cap and gilt stopper. It is unmarked except for a fancy monogram and it may also have been made to be worn on a chatelaine. This fine antique perfume bottle is in excellent condition with no dents, bends, corrosion, losses, damage or repairs. All items are thoroughly and conservatively graded and all condition issues are noted; all items are vintage or antique and may have slight signs of gentle use. Expedited tracked parcel shipping to the U.S. starts at $21 (other spots may vary, air is higher) - tracking and insurance are included in shipping quotes. Items paid with a credit card will be shipped to confirmed addresses only. We do ship internationally. All of our prices are in $US. PLEASE NOTE: we DO NOT accept PayPal, only VISA and MASTERCARD. 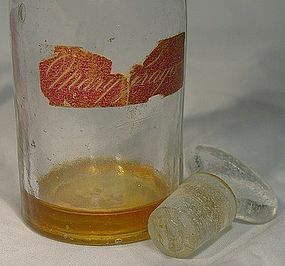 A McCamus Bobcaygeon Ontario medicine chemical bottle circa 1900. This 2-3/4" high (with lid) medicine or chemical bottle with the original paper label has a turned wooden mushroom cap. Thomas McCamus (b.1860) was the son of Wm. McCamus, a druggist in Bobcaygeon, Ontario, Canada (in the 1881 census, he was listed as a clerk, presumably in his father's druggist and chemist store, which he must have later taken over as indicated by his name on the label). 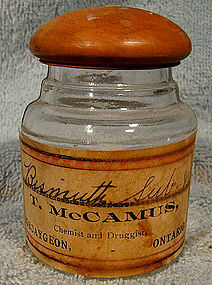 The printed label states: T. McCAMUS, CHEMIST AND DRUGGIST, BOBCAYGEON, ONTARIO. and it has BISMUTH SUB. (illegible). The turned wooden cap is cork lined and it has a fragmented black paper lining. The bottle is two-molded with the expected flaws. This early Canadian medicinal bottle is in excellent original condition with no chips, cracks, losses, damage or repairs other than some minor staining and fading to the label and some cracking and loss to the lid liner. Please note that the pictures are darker than the actual label, and it looks much better condition-wise in person. All items are thoroughly and conservatively graded and all condition issues are noted; all items are vintage or antique and may have slight signs of gentle use. Tracked Packet shipping to anywhere in the U.S. is $14.00 - this includes online tracking, air service and insurance up to $70. Items paid with a credit card will be shipped to confirmed addresses only. We do ship internationally. All of our prices are in $US. PLEASE NOTE: We DO NOT accept PayPal. An 8-3/8" tall embossed clear 8 ounce Ontario Soda Water Bottle from Welland, Ontario, Canada with a Star of David design. This c1900-10 bottle is in very good original condition with no chips, losses, damage or repairs other than an internal stress crack or internal cleave on the lower rim and some factory roughness and straw marks around and on the bottom. All items are thoroughly and conservatively graded and all condition issues are noted; all items are vintage or antique and may have slight signs of gentle use. Surface shipping to the continental U.S. starts at $12 (other spots may vary) - insured is higher, and mandatory on items over $85 if paid with a credit card. Items paid with a credit card will be shipped to confirmed addresses only. We do ship internationally. All of our prices are in $US. NOTE: we DO NOT accept PayPal. 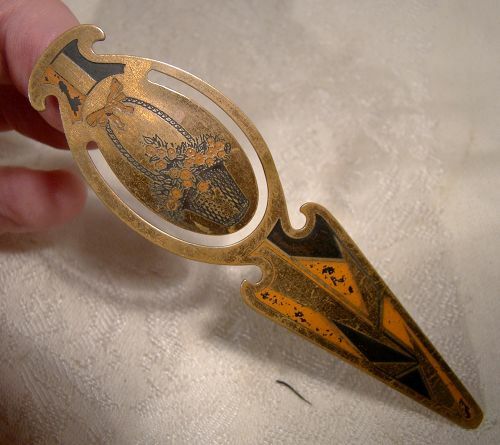 A vintage enamelled on brass Art Deco 4-1/4 x 1" bookmark c1920s. Featuring an angular Deco design and a flower basket motif, this unsigned bookmark is in very good original condition with no scrapes, dents, monograms, bends, corrosion, damage or repairs other than some minor enamel losses and rubbing to the original lacquered finish. All items are thoroughly and conservatively graded and all condition issues are noted; all items are secondhand and may have slight signs of gentle use. Uninsured surface shipping starts at $5 (to the US - other spots may vary) - insured is higher, and mandatory on items over $100 if paid with a credit card; credit card items will be shipped to confirmed billing addresses only. We do ship internationally. All of our prices are in $US.